Losing our beloved mobile phone can be a very exasperating experience. Mobile devices like smartphones have become an integral part of our lives. Losing our smartphone not only worries us about our personal data that someone might access and use it for immoral purposes, but also reminds us of the hectic process that would follow to block the SIM and get a fresh SIM from the telecom operator’s store. While it is not possible for the telecom operators to keep your devices from being lost or stolen, Reliance Jio is letting its subscribers block (suspend) or resume their SIM services on their own. 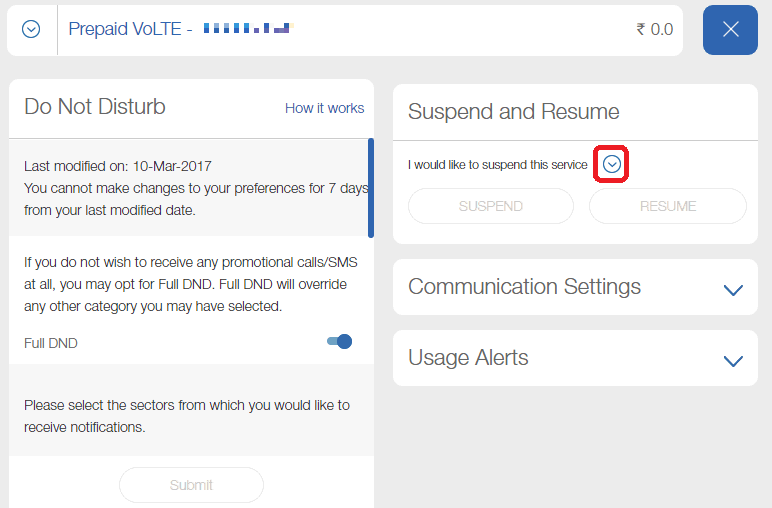 Here Is How To Suspend Or Resume Your Reliance Jio SIM? Login to the user portal with your Jio ID and password. Now click on ‘Suspend and Resume’ and click on the small drop-down symbol as seen in the screenshot. 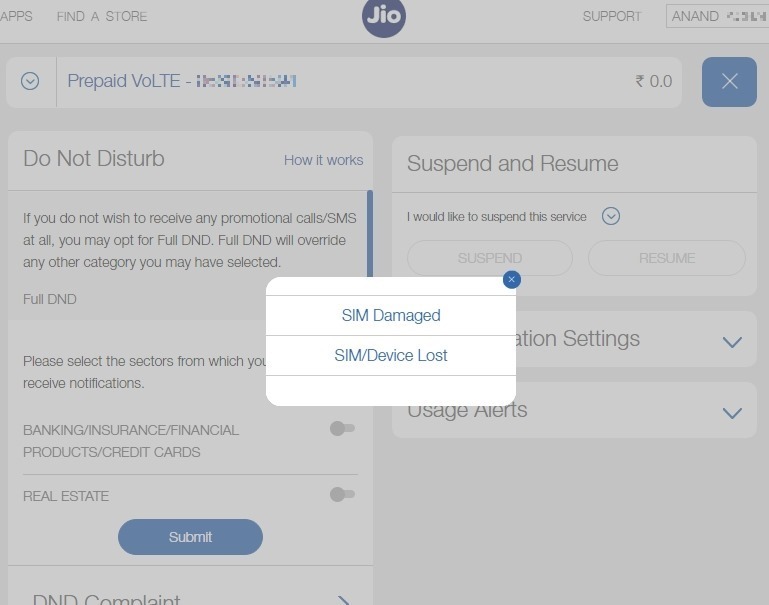 Now select your reason for suspending your Jio SIM – ‘SIM Damaged’ or ‘SIM/Device Lost’? After selecting the reason, the ‘Suspend’ button will get activated (in blue colour). Click on it and you would have successfully suspended your Jio SIM. You can use the similar procedure for resuming the services back on your SIM. Note: As of now, the subscribers can suspend/resume Jio services only via the Jio website by logging into their respective accounts. The same cannot be done via the MyJio mobile app. Reliance Jio has not just disrupted the Indian telecom market with its disruptive promotional plans offering free services based on 4G VoLTE technology, but it is also aiming to offer seamless customer support as well. You can perform a whole lot of operations through the Jio portal and MyJio app including change registered mobile number, email address, and alternate contact numbers. You can also link another Jio number to your existing account, change your preferred communication medium, check your recharge history and tariff plans, locate your device, raise and manage your service requests, and configure your Do Not Disturb (DND) settings. We hope that Jio will continue to amaze us with us with better and better network quality, fast data speeds, and customer service offerings. If all telecom operators start offering such services on their self-care portals, then they will save a significant portion of their operational costs while delighting their customers. 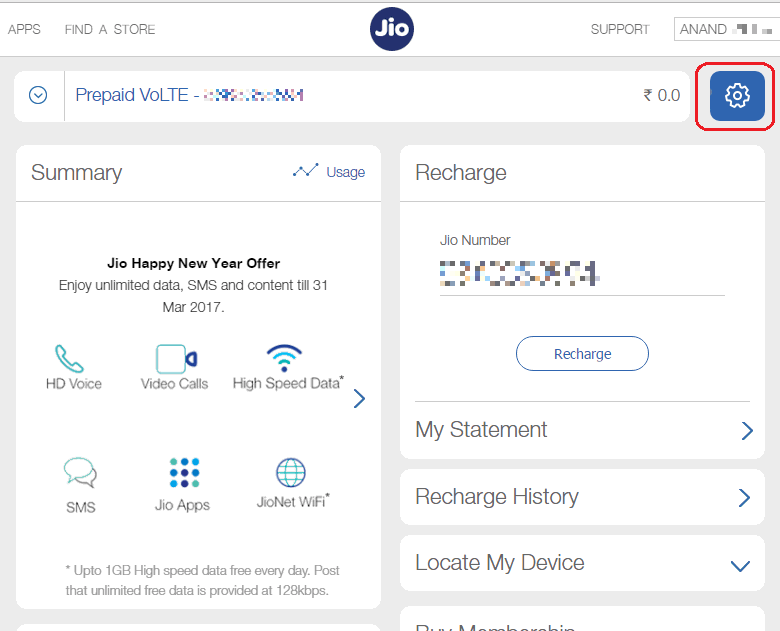 "You Can Easily Suspend / Resume Jio 4G SIM Services; Here is How To Do It! ", 5 out of 5 based on 4 ratings. How long can we suspend the services? is there any limit on number of days that can be suspended? Will our data plan validity be extended after resuming services according to number of days suspended? How will you use all these ig your phone is lost ? how to suspend services without the phone ?